In addition to handicapped stalls, automatic toilet tissue dispensers are extremely useful for healthcare facilities, nursing homes or anywhere else where the spread of infection is a major concern to cleaning professionals, tenants and facility executives. According to a study by Dr. Charles Gerba, a professor of microbiology at the University of Arizona, toilet tissue dispensers in public restrooms have 150 times more bacteria than the average toilet seat. 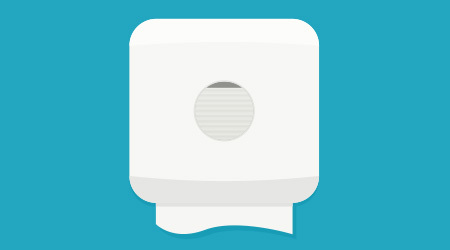 By removing a touch-point from the restroom, automatic toilet tissue dispensers prevent cross-contamination. “It’s one less piece of plastic that someone would have to touch, one less opportunity for cross-contamination in the restroom,” says Cain. To further reduce the potential of cross-contamination, dispensers completely enclose the tissue so users can only touch the tissue they are going to use. When a tissue roll is covered, it not only is protected from users’ hands, but also from other germs found in a restroom. For example, when a toilet is flushed, the plume can release germs into the air. Touch-free operations are important for restroom aesthetics, and automatic toilet tissue dispensers can be one more item to promote an upscale image in Class-A offices and high-end retail stores and restaurants. Toilet tissue is the last area of the restroom to go touch-free. Over the years many suppliers have doubted the touchless movement would include toilet tissue, so it’s understandable if facility executives (and even some BSCs) are skeptical about this new innovation. But seeing is believing. Contractors should have facility managers test out a touch-free dispenser while comparing it to a more standard, manual dispenser. “You’ve got to demonstrate it for them,” Lambrecht-Hudson says.